Jeanne Lorenz is a visual artist whose work explores ecology and human collaboration with natural systems. Lorenz has walked 2,000 miles of the Pacific Crest Trail with her husband and eleven-year-old daughter. Traveling by foot and living outside for five months, Lorenz lived the daily experience of the California drought. As the family traveled from water source to water source, through the Anza Borrego and Mojave Deserts, through the Sierra Nevada and Cascade ranges, the word "water" became a mantra. Off trail, Lorenz lives within a protected watershed in the 200-person community of Canyon, California, where residents share communal springs. 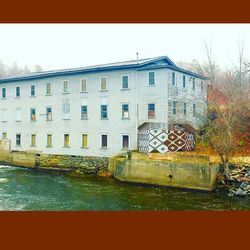 In December of 2015, she completed a month-long residency at the Vermont Studio Center and created large-scale, site-specific installations exploring the intersection of our collective industrial past and the changing climate of our future.